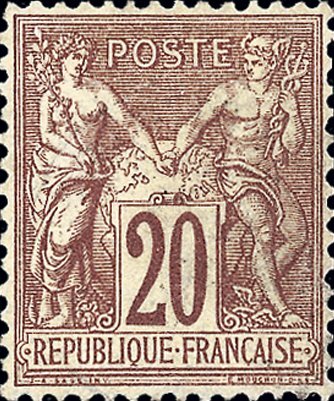 The first postal map stamp is the “Type Sage” issued by France in 1876 to 1890. It was designed by Jules-Auguste Sage, whose name appears in small type below the lower left inner frame line, and engraved by E. L. Mauchon. The stamp shows allegorical figures of Peace and Commerce with joined hands across a globe. On the globe the coast of North America and Europe, with 6 or 7 of the principal capitals of Europe marked, can be seen, as well as a distorted coast line of South America. Stamps with a similar design were issued by French colonies and offices, including Offices in the Turkish Empire, Zanzibar, and Morocco. The original design showed the value superimposed directly on the globe which had a much clearer map of the continents bordering the Atlantic Ocean. However, the design finally accepted had the value on a tablet superimposed on the globe, which concealed much of the map. A similar design, without the value tablet, was used for a Mandat de Poste (a postal money order).